Another task of the French Camouflage Service was deception; to trick the enemy into believing that something was happening when it wasn’t or troops were in a specific area when in fact they were in another. One ruse was the so-called ‘Chinese Attack‘ where dummy soldiers would be used with real covering fire to simulate an attack taking place. This would prompt a response from the enemy who would reply often revealing positions that could be spotted and then dealt with by artillery fire, or it might draw enemy troops into a forward position in great number which could also be dispersed with shell-fire. 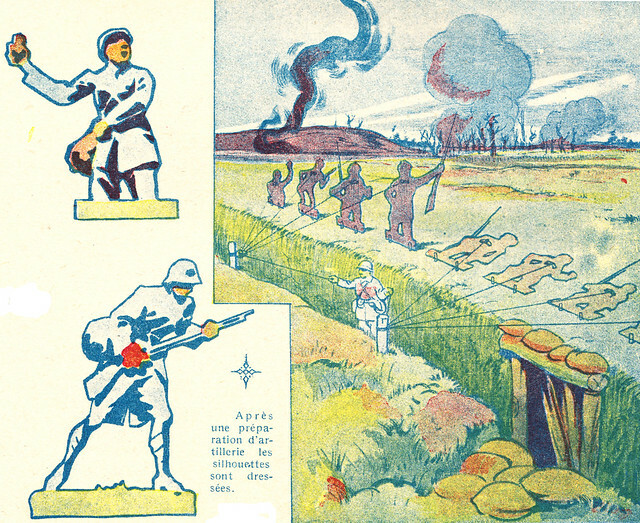 This illustration from La Guerre Documentée shows one such Chinese Attack taking place. A series of life-time wooden cut-outs of soldiers have been made and painted and been placed in front of a trench, and can be raised and dropped using a pulley system. This example is quite a sophisticated one; some British examples I have come across indicate that sandbags stuffed with straw with a tin helmet pushed on top were used; how effective that was is difficult to say. This entry was posted on 18/04/2012 by sommecourt. It was filed under France, French Army, French Front, Great War, Verdun, Western Front, WW1 and was tagged with Camouflage, French Army, French Front, Poilu, Verdun, WW1.